In my latest PopMatters post, I write about the danger of defying expectations and (once again) mourn the sad fate of Mirror's Edge. Everyone has a few games that they can't help but love. For me, Mirror's Edge is one of those games. Don't get me wrong: the game has plenty of shortcomings, and I agree with most of the things Sinan Kubba suggests in his article about how to fix Mirror's Edge. However, I think the game's biggest obstacles can't be overcome with iterations and simple fixes. Mirror's Edge was a victim of history and misaligned expectations. The game's design philosophy is a sharp departure from most modern games, in that it makes the player work hard to pull off amazing things. Its beautiful graphics seem to put it alongside Assassin's Creed or Call of Duty, but underneath its sheen lies a difficulty system that is more Ghosts 'n Goblins than Gears of War. This is understandable: times change, and so do people. For better or worse, most players simply don't want games to be as challenging as they once were. Thus, many of the things that seem like flaws in Mirror's Edge are simply anachronistic design choices. Not only did Mirror's Edge defy people's expectations, it wasn't even designed to address them. 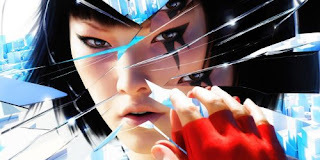 Thanks to unclear pre-release coverage and player's preconceived notions, Mirror's Edge became a victim of its own achievements. Somewhere along the line, a strong popular belief that Mirror's Edge was meant to be played non-violently gained popularity, thereby setting the stage for frustration and disappointment. While it is possible to finish the game without killing any enemies or using guns, it is an extremely difficult way to play. I can't remember another time when a single achievement or gameplay variant asserted such a strong influence over how people thought the game should be played. I'm not exactly sure where all of this leaves us. As romantic and wistful as I might sound, I am well aware of how hard it is to purge one's mind of presumptions and comparisons before diving into a game. They hype machine is relentless, and I think it's natural to want to follow an interesting game throughout its development. Jorge and I have even extolled the benefits of hype in the past: high expectations can push people to take risks and push boundaries in terms of design and criticism. Sometimes the most interesting games are the ones that disappoint us. Mirror's Edge is a perfect example: folks are still talking about it nearly three years after its release. Striving to maintain a blank slate when approaching every new game is fool's errand, but I still think gaming whiplash is a powerful force that is rarely addressed. When players hurtle towards a game anticipating a specific experience, the shock of the unexpected can negate a game's positive aspects, turning strengths into sins. I found Mirror's Edge to be so incredibly frustrating _because_ there is clearly an excellent game in there, and it's the game we all thought we were getting, but it's buried under some truly horrible design decisions. He runs away from two different firefights, calls it a "first person action adventure" with "chases" and "puzzles" and multiple paths. He doesn't fire a single bullet, and even throws the gun away. Admittedly, there is a line about how playing that way is one of the harder challenges in the game, but that's not what was presented at all. The parkour was fantastic, and a game based around it would have been amazing. But instead the game was way too linear, and many of the chokepoints could only be passed by using a gun or getting incredibly lucky avoiding bullets. The final level, which should have been some kind of elaborate chase sequence, was a shootout! I will admit that I wasn't able to shake my preconceived notions about the game, and judged it more harshly because of it, but to be fair, it was absolutely presented as an action adventure game and not a shooter. It turned out to be a poor shooter with some parkour mixed in. I wrote something about the whole matter of how expectations influence peoples' opinions on games a while ago, but I never thought about Mirror's Edge being an example for that. For me it's just always been a simple example of people not knowing what the eff a good game is. The finish the game without killing anybody Achievement ocurred to me as the way I personally wanted to play the game the first time through even (kinda like finishing an MGS game without killing anybody) and except for maybe one or two scenes it never made the game extraordinarily hard. And in those scenes for me it was more like a "Well, you've chosen your path, now stick to it" kind of feeling. For me it somehow never felt like the game was trying to screw me or something. On the other hand, if you really wanted to use guns, the whole thing became almost too easy. I have to admit, I've never fully understood where peoples' frustration with the game came from really. Well, I guess we can only hope, that DICE will be done making Battlefield Games and return to Mirror's Edge 2 as soon as possible. And I honestly hope they don't listen to peoples' complaints about the first game too much. I mean I even liked the story (the bits that were there had some potential) and it would be a shame to see them make a pure time trial thing out of it. Although, I had a blast with those as well as soon as I had finished the actual game.